190E 16v speed records. 50k KM covered at155 mph for 201 hours. 190E 16v speed records. The Mercedes-Benz 190 E 2.3-16 was a star of the year 1983 – and set no less than several records between 11 and 21 August on the high-speed Nardò track in Italy. In just 201 hours, 39 minutes and 43 seconds it covered a distance of 50,000 kilometres. In addition to this achievement it also set two more world records over a distance of 25,000 kilometres and nine records in its class. For the vehicle and above all for the then new four-valve engine, this provided impressive proof of the reliability over an extreme long distance. All in all, there were three identical vehicles of the sporty version of the Mercedes-Benz 190 (W 201) in use in Nardò, which four weeks later was presented to the world for the first time at the IAA International Motor Show in 1983. The technical and visual specifications of the Nardò version were largely identical to the planned series production version, and with these records they delivered impressive proof of the performance and reliability of the top-of-the-line model in the compact class at the time. Since driving on the banked circular track produced hardly any lateral forces – the track is practically a “straight line” – the planned power steering was not necessary. The three outright records over distances of 25,000 kilometres, 25,000 miles and 50,000 kilometres, as well as the other nine international class records in category A (automobiles) group I (petrol engines) in the class between 2000 and 3000 cubic centimetres, were set on the 12.6-km circular test track in the Italian town of Nardò, where daytime temperatures of 40 degrees Celsius heated the vehicle interior to more than 50 degrees Celsius, putting additional strain on driver and vehicle. 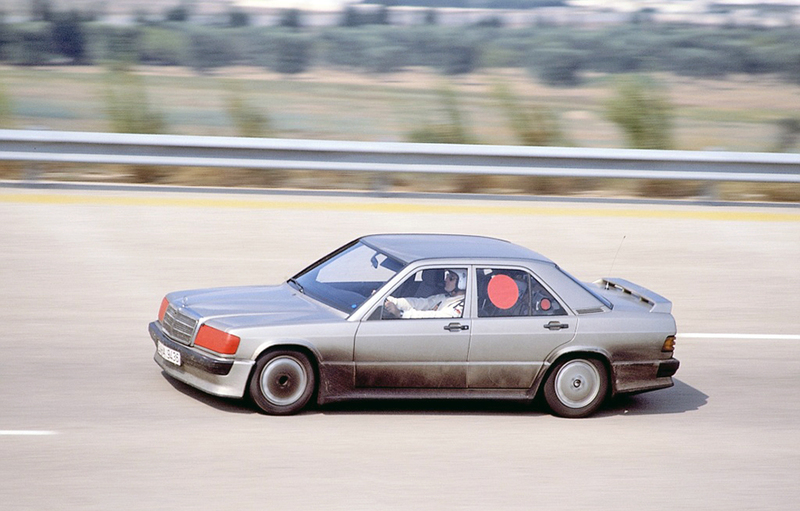 Mercedes-Benz 190 E 2.3-16 (W 201), world record drive on the high-speed track in Nardò/Italy, 11 to 21 August 1983. The car covered 50,000 kilometres and set three world records and nine class records. The photo shows a service stop. Nevertheless, the new 2.3-litre four-cylinder engine ran like the clockwork on the full-throttle run that lasted just shy of nine days. The power output of 185 hp (136 kW) in conjunction with aerodynamically optimised modifications to the bodywork was sufficient to propel the car to a top speed of around 250 km/h. In light of the virtually constantly driven top speed at engine speeds of around 6000 rpm the fuel consumption of slightly more than 22 litres per 100 kilometres was extremely favourable. For the team of drivers and the crew in the pit from the Mercedes-Benz test department, the tip of the Italian boot was no unknown territory even back then: all new models had to endure similarly tough and extensive test drives on the way to series production, some of which were conducted in the same location. In 1976, 1978 and 1979, various C 111 diesel and petrol models also set ten distance and two time world records in Nardò. The three vehicles were equipped with distinct radio-frequency identification transmitters to provide information about the number of completed laps, the distance covered and the average speed, independent of the official timing. 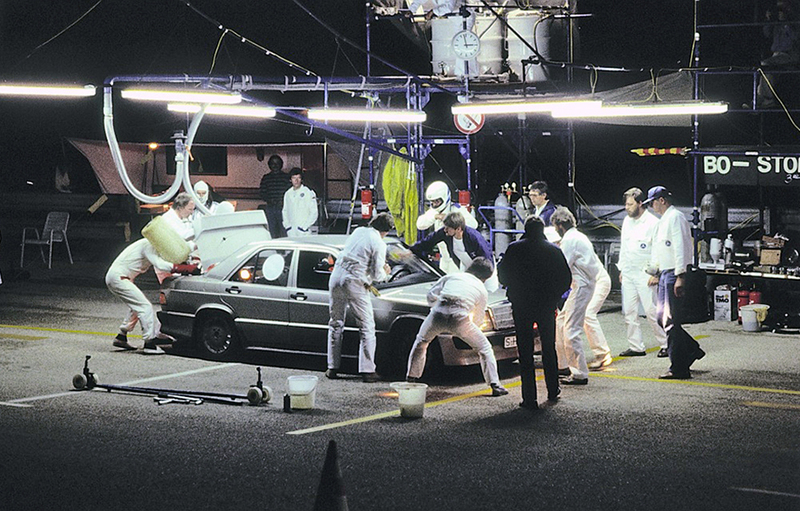 The vehicles were also equipped with different colour beacons to allow unmistakable identification of the individual vehicles day and night and ensure accurate analyses of the lap times recorded by the double light barrier. The car covered 50,000 kilometres and set three world records and nine class records. The photo shows a service stop at night. While the 2.3-litre M 102 four-cylinder engine with dual overhead camshafts and 16 valves had the power output of 185 hp (136 kW) intended for series production, the injection and ignition system was adapted to the special operating conditions – driving under a constantly high load and engine speed. The radiator was also identical to the series production version, albeit without a fan because the normal relative wind at the high speeds created sufficient air flow through the radiator. A radiator shutter was installed to ensure the engine’s operating temperature would not drop during the cooler hours of the night. It allowed up to two thirds of the radiator to be covered up from the driver’s seat, and furthermore reduced the drag. The radiator grille was covered with a quick-exchange insect screen to prevent a blockage of the air ducts. Detachable plastic caps protected the headlamps against build-up of insect residue or damage during the day. The clutch and the manual five-speed gearbox were identical to the planned series production model, but the car was only equipped with a manual steering system. Since driving on the banked circular track produced hardly any lateral forces – the track is practically a “straight line” – the planned power steering was not necessary. In addition to mere material testing, the Berlin research group from the then Daimler-Benz AG used this long-distance test for its research into issues related to traffic psychology. For the first time this made it possible to measure driver strain under precisely defined conditions and consequently arrive at meaningful results.